Look at that lovely pair of convex hulls! Work on Free Company continues through the Summer Holidays down here in the shed. I’ve been learning about exciting topics like convex decomposition as I bring the game’s physics implementation up to scratch. It’s been tough going, mostly as I haven’t had any real experience fiddling about with physics in this kind of depth before. It seems that the moment you want to go beyond knocking over piles of boxes things get a little more complicated. Bah. 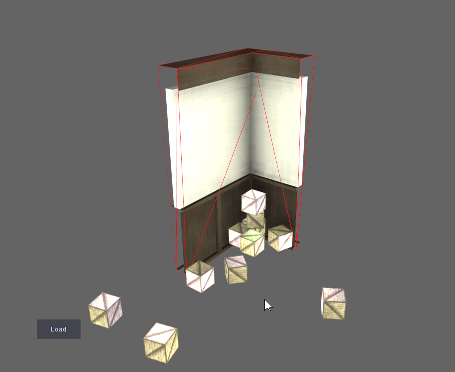 I’ve managed to wrap pretty much every object in the game in some kind of physics representation now, using a mix of hand crafted and auto-generated convex hulls. This means for a start that the ragdoll dead bodies now no longer clip embarrassingly through walls, it also means that I can click directly on the arch shaped doors in the game to interact with them. I wanted to have a some kind of video of me finally cracking open doors with wild abandon as the mercenaries wander freely about the levels. Unfortunately, I’ve run out of time this week to get the easier non-physicsy parts of it working properly yet so it’d probably just look a bit daft to the casual observer. Expect it next time instead. It’s also been ludicrously hot here in London, so I’m amazed my brain even managed to do anything other than melt. Good work brain. Super clever cover calculations using raytests! Stripping out old crappy physics code! Finally not having to think about physics for a while! This entry was posted on Friday, August 5th, 2011 at 18:28	and tagged with physics bloody physics and posted in Free Company, Programming. You can follow any responses to this entry through the RSS 2.0 feed.